Electrosexual’s new track Demolition has got quite an aftermath, the new release has not gone unnoticed in the world of electronic music and has been intensively covered by the press: Bernard Dagorn’s blog’n’roll, The Pink Snout, Candy Club, Noisey, Vice, Wrangelkiez, Killerrr or Expatriarch Radio. To celebrate this achievement and the projection of the Demolition video, the artist set the night on fire with fellow DJ Hanin Elias at Luzia in Berlin mid-January. This month, Electrosexual presents his new podcast for Your Mom that starts with an artsy Ginsberg/Darc intro. 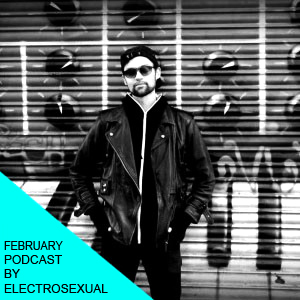 Electrosexual’s hot beats will help you going through the cold month of February. If you are still not convinced, go check his show in Zagreb, Croatia on Friday the 1st! Book Electrosexual worldwide for live shows and DJ sets HERE. Previous Plateau Repas, et voilà!